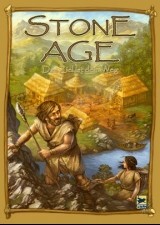 Other products in the "Stone Age" series. Great entry level worker placement game! Easy to learn, several strategies to wining. Great family game my kids (11 & 13) love this game. My group's favorite game to play. It's made by Rio Grande so the production value is top notch. The theme and gameplay are not intimidating for new gamers, but provide more than enough room for strategy for experienced players. Stone Age is a great intro to worker placement games and makes an excellent use of dice (rolling them to harvest resources). Enjoy! This is a great family game. Just the right amount of randomness created by the dice. The components are excellent. This is a keeper for every game collection. The board is beautiful. This is a great worker placement game. You have to take turns putting your people to work while trying to better develop your people. My friends love this game. This is one we play often. A must have in your game collection. Good amount of versatility which means that you can try out a bunch of different strategies. Very interesting game! Would definitely recommend this as a good "next-step" type game if you're fairly new to the hobby! This is quite possibly my favorite game. In turn order, each player chooses one place to put a worker or workers. There are some agonizing decisions to make which I think is what makes the game so good. My wife and I love to play it just the two of us and it worked very well. I am excited for the expansion coming soon. Fun worker placement and die-rolling in prehistory, one of my favorite games, nice art, leather cup! I'm a sucker for components, what can I say? I'm not apologizing. Aside from the great production, this is a solid game. I enjoy worker placement games, and this one is a blast. Nice theme, great components, smooth gameplay. Very good. Really like this game. You can have several different strategies. At first I thought you'd need the cards to win, but other strategies also can win. Good two player game. At first I usually won, then my husband. Now it's a toss-up.